The city of San Diego has updated their bicycle program page and you can now request bike racks from the city. Please note that the City of San Diego website now offers instructions on how to request installation of bike racks and general information about our Bicycle Program. Please feel free to distribute this information to your board members and business community however you feel appropriate. We anticipate the first round of 100 new racks (pictured below) will be delivered to the city in January 2014. If you have already submitted bike rack requests directly to Tom […], you do not need to resubmit for those locations. 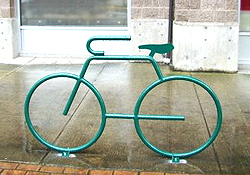 If you have any questions regarding the bike rack program, please contact Thomas Landre at tlandre@sandiego.gov.